Our new paper is online available from today in Biological Conservation: a pdf here! Shellfish reefs strongly modify habitat conditions in soft-sediment ecosystems. These non-trophic interactions strongly alter community and food web structure. Simple food web metrics captured these changes; classic community (biodiversity) metrics did not. Food web metrics are a useful tool to measure conservation and restoration success. 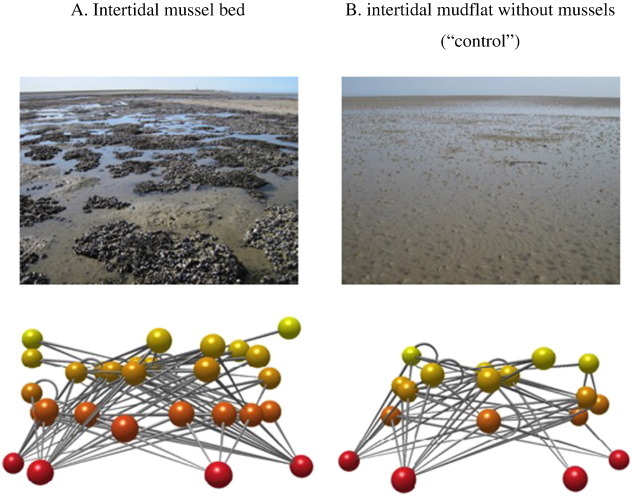 Food webs of (A) intertidal mussel beds and (B) intertidal mudflats without mussel beds (“control”). The food web of a mudflat without mussel bed is typically simpler. Nodes represent species and lines links between species if a species is included in the diet of the species higher up in the food web. Node colors changes from red (basal species) to yellow with increasing trophic level. Note that the food web on mussel beds has a higher species richness (# nodes), link density (lines per node; L/S), but not a higher trophic level of top predators (node color).